I am digging a hole for a 21' round above ground pool and I am digging the middle out about 2 feet. I was wondering what the proper slope is from the deep part to the level part in the ground in the pool. Right now I have the taper about 4-5" per foot. Just wondering if that is enough or do I have to taper it more. Hi Tim. The more gradual the slope the better and what you have sounds perfect. 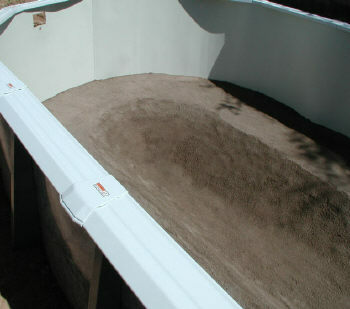 If you make it to steep you will have a hard time getting the sand to stay in place long enough to get the liner installed. You could also wind up with wrinkle issues on the steeper slope. 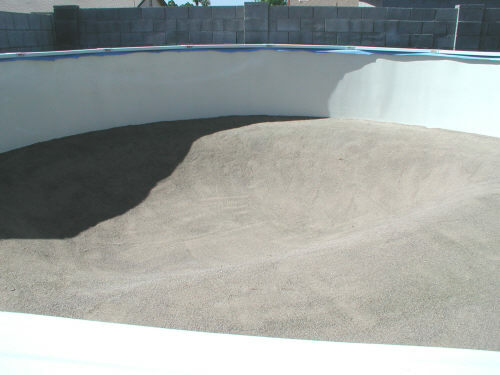 This photo shows a deep end on a round pool. A deep end has steeper slopes around the outer edge and a shallower slope coming into the shallow end. For a pool that will have a deep center something in between the two is fine. Any time you have a deep area in an above ground pool you are better off stretching the liner into place. If done correctly you will have no wrinkles when you are done. I would like to install a 21' (52" tall) pool with a "liner floor" that is level for the outer 4 or 5 feet circumference and then gradually pitches toward the center so that depth is no more than 1 foot more than the outside 4 or 5 foot perimeter. I expect that in addition to offering a deeper portion in the center, it will also allow debris to settle in the center as filtration occurs and making it a quicker/easier vacuum. I've seen it done a number of times with no apparent complications. Hi Don The only downside to doing this would be the wrinkles that might occur. Not all liners will install into a deep area wrinkle free. If you stretch a Doughboy expandable liner into this area you will probably be just fine. Deep ends are not a problem. They can be in the center or off to one side. You just need the right liner and it needs to be installed correctly. Flat bottom pools are easier to get that perfect liner installation, but deep areas can be done, if you know how and use the right liner. Make sure your ledge is even all the way around and that you have a nice even slope into the deep area. You don't want a drop off, it should be a nice slope. We purchased a 33x18 Swim and Play Keystone pool with an expandable liner. We got all excavation done. My question is, it has the buttress style angle supports, with the strap running from angle to angle, no solid bottom support on angle, my father in law has the same pool with deep end and had it installed and can't remember what they did with the supports in deep area, have seen the way they do it on the Doughboy type supports but don't have a clue on this type of support? shows a diagram for converting a strap pool to an expandable liner pool. It is simply a matter of duplicating the Doughboy method. You cut the straps off, you add a sturdy L bracket to the underside of the brace channel and you install a couple of 8 x 8 x 16 inch blocks under and behind the brace assembly. That's really all there is to it, that and be sure you use the pressure plates on the inside of the pool. The block behind the brace and the block behind the L bracket keep the assembly from pushing out. The combination of the block behind the L bracket and the pressure plates on the inside of the pool keep the tops of the braces from pushing out. The pressure plates take the weight of the water and spread it out across the fronts of the channels, preventing the braces from pushing out at the top. We have a 12' x 24' Doughboy above ground pool partly in ground. The wall is 48" leaving us with only about 36" of water. Can we make this deeper or are there straps from side to side that will be in the way? Hi. This size pool is made two ways, with and without straps. Either way a deep end is more than possible. On this page Above Ground Pool Directions I show how a pool with straps can be converted to one without straps. 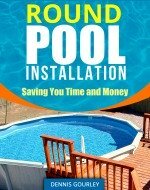 If your pool is a foot or more in the ground you could cut your straps out and not have to worry about converting your pool and installing the big blocks. The blocks are used to hold the wall from pushing out with the water pressure, the dirt around the pool would do the same thing. When digging the center out be sure to leave all the pressure plate assembly on flat ground. Come in about six inches from these plates and start sloping. This means your pool sides will have about a three foot ledge. The ends should have a ledge also but not as big. You should have at least a foot and a half before your slope begins, this holds the wall and cove in place. Below are a few pages that might help with installing the new liner.